The third cookie we had at this high school get-together is the cranberry-orange version of the slice-and-bake cookies Deb posted about on Smitten Kitchen. (There are many reasons to admire Deb, not the least of which is that all these delicious cookie recipes were posted while she was actually on vacation in the Caribbean - that is amazing preparation.) I've made similar slice-and-bake cookies before, usually the (Meyer) lemon sablés from Amanda Hesser's Cooking for Mr. Latte (and Orangette's adaptation). This "fillings" version was quite good, but I am not convinced I don't prefer the simpler lemon version instead. 2. Position the racks to divide the oven into thirds and preheat the oven to 350°F. Line two baking sheets with parchment paper. 3. While the oven is preheating, roll cookie logs in any coatings of your choice. Then, using a sharp slender knife, slice each log into cookies about ⅓ inch thick. (You can make the cookies thicker if you’d like; just bake them longer.) 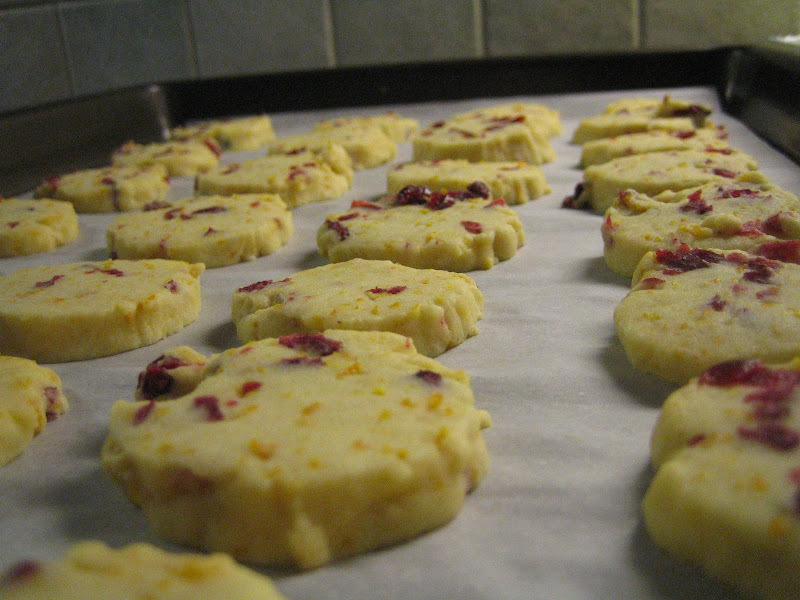 Place the cookies on the lined baking sheets, leaving about ½ inch space between them. 4. 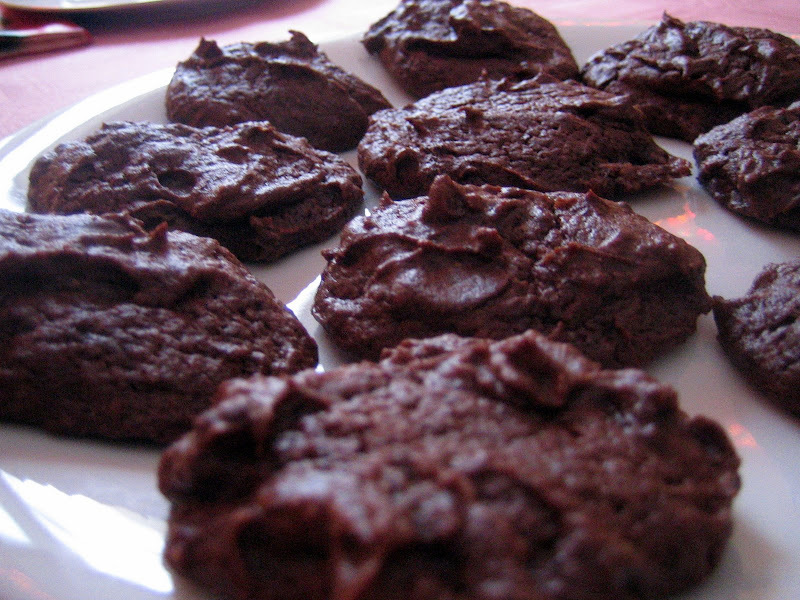 Bake the cookies for 12 to 14 minutes, or until they are set but not browned. Transfer the cookies to cooling racks to cool to room temperature. Keeping: Packed airtight, the cookies will keep for about 5 days at room temperature, or in the freezer for a month. Unbaked logs can be frozen for longer. 3. Place the butter in a medium microwave-safe bowl, and microwave briefly, until just melted. Add the sugars, and sift in the cocoa. Stir to blend well. The mixture will be somewhat thick and pasty, like wet sand. Add the yogurt and vanilla and stir to mix thoroughly. Add the dry flour mixture, and stir to just combine. Add the chocolate chips and stir to incorporate. 4. Drop the dough by generous tablespoons onto the prepared baking sheet. Bake for 9 to 11 minutes, or until the tops of the cookies have crackled slightly and look set. Transfer the sheet pan to a wire rack, and cool the cookies on the pan for 10 minutes. Transfer them to the rack to cool completely. Repeat with remaining dough. Whenever I go to visit my parents during the holiday season, I always check to see if any of my good high school friends are around and are interested in getting together. Two of them were home for Christmas, so we met at my parents house for an afternoon. This was a great opportunity for me to try out some of the cookies I'd been reading about recently (and not so recently). A great recipe posted in December appeared on Smitten Kitchen. 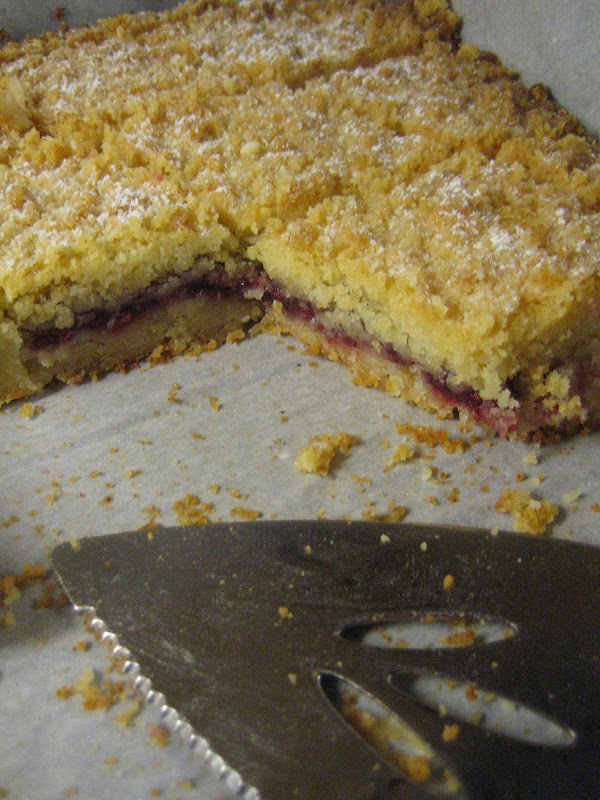 It was for Austrian Raspberry Shortbread. The pictures accompanying the recipe made me salivate, and my mom's house was the perfect setting for making it, since my mom owns a food processor and I (due to space constraints) do not. This was definitely a winner - even my mom, who at first declared it was too doughy (she would have used more jam and less dough) warmed up to it later. I sent my friends home with some of the leftovers, and one of the moms later sent my mom a card expressing how much she had liked it. 1. Cream the butter in a mixer fitted with a paddle attachment (or using a hand mixer) until soft and fluffy. Add the egg yolks and mix well. 2. Mix the granulated sugar, flour, baking powder, and salt together. Add to the butter and egg yolk mixture and mix just until incorporated and the dough starts to come together. Turn the dough out onto a floured work surface and form into two balls. Wrap each ball in plastic wrap and freeze at least 2 hours or overnight (or as long as a month, if you like). 3. Heat the oven to 350°F. 5. With a piping bag with a wide tip or a zip-lock bag with the corner cut off, squeeze the jam over the surface as evenly as possible, to within ½ inch of the edge all the way around. (Be careful not to cut too big of a corner off the zip-lock bag, like I did, or the jam will come out in too thick a stream.) Remove the remaining dough from the freezer and coarsely grate it over the entire surface. 6. Bake until lightly golden brown and the center no longer wiggles, 50 to 60 minutes (or longer). As soon as the shortbread comes out of the oven, dust with confectioners’ sugar. 7. Cool on a wire rack, then cut in the pan with a serrated knife. For the savory snacks for our holiday party, we had four things: walnut, pear, and roquefort madeleines, salmon rillettes, mushroom caviar, and crudités. Unfortunately, we forgot to take pictures of the last three things on that list, and so all I have is a picture of the madeleines. These madeleines were an interesting idea, but I am not sure I'd make them again. I will definitely make the salmon rillettes and mushroom caviar again, and crudités are always a fun, easy addition (ours were with cucumber, baby carrots, and radishes this time). 1. Season the salmon on both sides lightly with a bit of salt. Steam in a steamer basket until just cooked, about 8 minutes. Once cooked, remove from heat and let cool. 3. Stir in the lemon juice, then the chopped chives and smoked salmon. 4. Remove the skin from the salmon and flake the cooked salmon over the mixture, then fold the pieces of salmon into the rillette mixture. Season with salt, if necessary. 5. Scrape into a serving dish, cover, and chill for at least two hours. Let come to room temperature before serving. Storage: The rillettes can be made up to two days before and refrigerated. They can also be frozen, well-wrapped, for up to two months. 1. Melt butter in a large skillet on high heat. Add the mushrooms and shallots. Sauté for 5 minutes stirring frequently. 2. While the mushrooms are cooking, heat a small skillet on high heat. Add the pine nuts. Cook, stirring frequently, until they begin to get a little toasted. (Keep your eyes on the nuts, they can burn pretty quickly.) As soon as they begin to toast, remove the pan from the heat and put the pine nuts into a small bowl. Set aside. 3. While the mushrooms are cooking, sprinkle lightly with salt and pepper. Once they have cooked for about 5 minutes, add the garlic and a tablespoon of dry white wine. Cook for an additional minute and remove from heat. Put mushroom mixture in a bowl, add the toasted pine nuts, and set aside to cool. 4. Once the mushrooms have cooled down a bit, mix in the lemon juice, sour cream, and parsley. Add more salt and pepper, if needed, to taste. Chill before serving. The third and last sweet snack we had for our party were the almond crescents from Simply Recipes. I will have to try making these again when I am not also making lots of other things and am less pressed for time, because shaping them was quite a challenge, and I am curious if I can make them prettier if I can devote more time to shaping each cookie. We had leftover ganache from making the chocolate kisses and so we dipped the ends of some of the cookies into it. 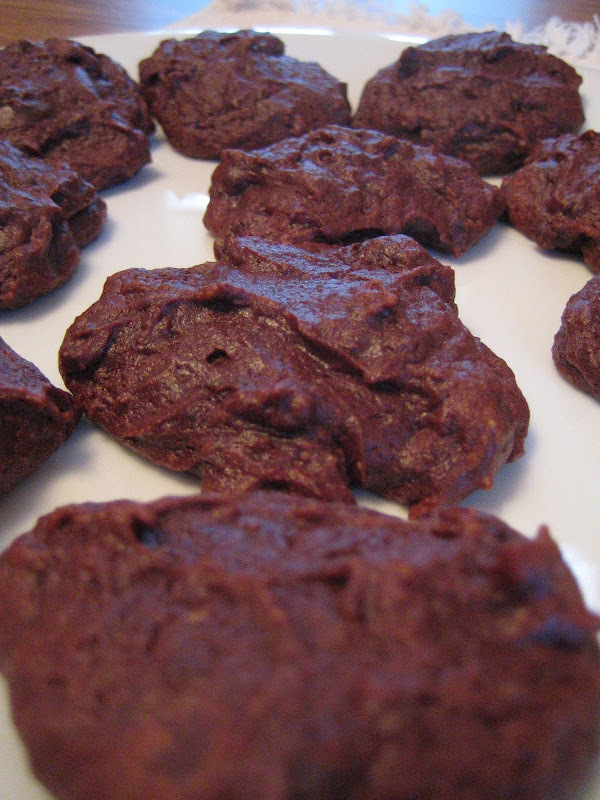 These dipped cookies were definitely the more popular ones. 1. Cream the butter and the sugar together until light and fluffy. Add the extracts and mix. 2. Add the flour and almond flour. Mix thoroughly. 3. Take generous tablespoons of the dough (it will be slightly crumbly) and roll it into a small ball, about an inch in diameter, and then shape into a crescent shape. Place onto parchment paper and bake at 350°F for 15-20 minutes or until a light golden brown. Another successful sweet treat from our holiday party were the chocolate kisses cookies from the cookbook Dolce Italiano by Gina De Palma (who has worked as an executive pastry chef at Mario Batali's Babbo). These took some work due to the multi-step process, but were definitely worth it, since the end result is both delicious and good-looking. Lucullian Delights profiled this recipe with beautiful pictures, but here's my attempt and the recipe again (in volume measurements only). 1. Preheat the oven to 325°F. Spread the almonds in a single layer on a baking sheet and toast them until they are light golden brown and fragrant, 14 to 16 minutes. (It took me less than that in my usually too-hot oven, probably 10-12 minutes). Remove the almonds from the oven and turn off the oven until you are ready to form the cookies. Allow the almonds to cool completely, then grind them in a food processor with the 1 tablespoon sugar until they are finely chopped. 2. In a medium bowl, whisk together the flour, cocoa powder, baking powder, and salt and set aside. 3. Using an electric mixer fitted with the paddle attachment (I used my handheld mixer), beat together the butter and confectioners' sugar on medium speed until creamy and light, about 2 minutes, then beat in the vanilla extract and rum and scrape down the sides of the bowl. On low speed, beat in the dry ingredients, followed by the ground almonds. Remove the dough from the bowl, flatten it into a disk, wrap it in plastic, and chill for about 1 hour, until it is firm enough to handle. 4. Preheat the oven to 325°F. Lightly grease two baking sheets with nonstick cooking spray or butter or line them with parchment paper. On a lightly floured surface, divide the dough into 3 pieces. Work with 1 piece at a time, keeping the others wrapped and refrigerated. Roll 1 portion of dough into a small log about ¾ inch in diameter. Cut each log into ½-inch lengths and roll each piece into a ball, then roll the balls in granulated sugar to coat them completely. (I just picked off small pieces of the dough and rolled them into balls. That seem to work fine for me.) Place the cookies on the prepared baking sheets, spaced 1 inch apart. Repeat with the remaining portions of dough. 5. Bake the cookies, rotating the sheets 180 degrees to ensure even browning, until they are puffed and cracking slightly on top, 12 to 15 minutes. Allow the cookies to cool on the sheets for 1 or 2 minutes, then use a spatula to remove them gently to a wire rack to cool completely. 7. To assemble the kisses: Pair up the cookies according to size. Turn one cookie upside down and, using a pastry bag fitted with a plain or star tip, pipe a small amount of ganache onto the flat side, then place the bottom of the second cookie on the ganache to form a sandwich; the two round tops of the cookies should be facing outward. Repeat until all the cookies have been used. Allow the ganache to firm up, at room temperature or in the refrigerator if necessary, then transfer the kisses to a serving plate. The cookies can be stored, layered between sheets of parchment paper, in an airtight container kept in a cool place for up to 3 days. Makes about 2½ dozen sandwich cookies. I decided to start this blog to better keep track of my thoughts about the recipes I've tried cooking and baking. And what better time to start than after our 2007 Holiday party. This being almost Christmas-time, it was a little bit more dessert-heavy than our usual parties. I made a Pecan Wine Cake from the Fall/Winter 2007 Better Homes and Gardens Special Interest Publication "Italian" that I stole from my mom's house. This is a very convenient cake to make for a party, both because it is quite big and because you can make it several days in advance and it will remain moist and delicious until the day of the party, as long as you keep it wrapped in tinfoil in the fridge. Just make sure you have a pretty big bundt pan or tube pan available - I am not sure mine was big enough given how high the cake rose during the baking process. Next time I make this cake, I will definitely consider cutting the recipe by ¼ or ⅓ so it works better with the bundt pans I have. Adapted from Fall/Winter 2007 Better Homes and Gardens Special Interest Publication "Italian"
1. Preheat the oven to 300°F. Butter and lightly flour a 9-inch (12-cup) fluted tube pan; set aside. 2. In a medium bowl, combine the sugars; set aside. In a large bowl, beat the butter with an electric mixer until soft and fluffy. Add half of the sugar mixture to the creamed butter. Increase mixer speed; beat mixture until smooth. Set aside. 3. In a large bowl, beat the eggs with a whisk (I used an electric handheld mixer) until light and fluffy (about 5 minutes). Gradually whisk the remaining sugar mixture into the eggs. Continue whisking until consistency is smooth and creamy. Add this mixture to the butter mixture; whisk until smooth. 4. In another large bowl, combine flour, mace, and salt. Alternately add the flour mixture and the wine to the butter-and-egg mixture; mix well with a wooden spoon after each addition. Stir in pecans. 5. Pour the batter into the prepared pan; place on a baking sheet. Bake in the preheated oven for 1 hour and 45 minutes to 2 hours or until the cake is golden and a knife comes out clean when inserted. Cool cake in pan for 30 minutes. Turn out on a wire rack and cool completely. If desired, sprinkle powdered sugar over the cake.